One of North America's smallest bats with a wingspan of 9-10 inches (22-26 centimeters) and weighing 0.1-0.2 ounces (3-5 grams). Similar to Western Small-footed Myotis in appearance, but distinctive characters include a steep sloping forehead, a rostrum that is short and delicate in appearance, and a tail that does not extend beyond the border of the tail membrane (Adams 2003). Primarily occurs in forested habitats at lower elevations. Summer day roosts include rock crevices, hollow trees and snags, under loose bark, and buildings. Hibernacula include caves and mines. Prey are mostly small flying insects; flies, midges, mosquitoes, moths, and beetles. Sexes roost separately during summer but together during hibernation. Emerges shortly after sunset to forage, flying at irregular intervals until dawn. Flight is slow and erratic as it hunts along edges of tree canopies and over water. Mating occurs during autumn. Females give birth to a single pup in late June or July. Potential reproductive lifespan is 15 years. Barclay, R.M.R. and R.M. Brigham. 2001. Year-to-year reuse of tree-roosts by California bats (Myotis californicus) in southern British Columbia. American Midland Naturalist 146(1): 80-85. Bogan M.A. 1974. 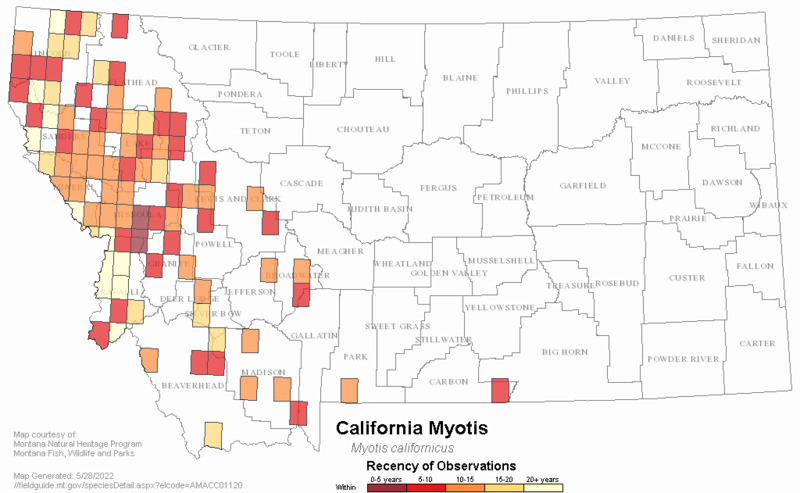 Identification of Myotis californicus and M. leibii in Southwestern North America. Biological Society of Washington 87(7): 49-56. Bogan, M.A. 1975. 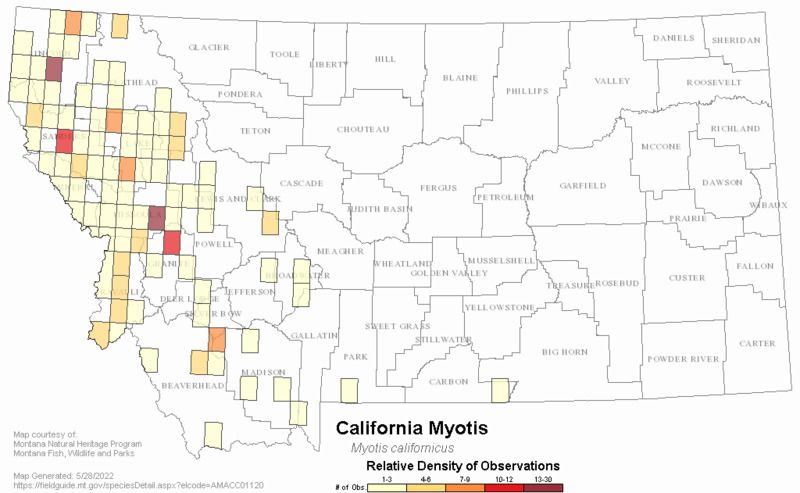 Geographic variation in Myotis californicus in the southwestern United States and Mexico. U.S. Fish and Wildlife Service Research Report 3:1-31. Brigham, R.M. and M.J. Vonhof. 1997. Roosting Behavior and Roost-Site Preferences of Forest-Dwelling California Bats (Myotis californicus). Journal of Mammalogy 78(4): 1231-1239. Constantine, D.G. 1998. An Overlooked External Character to Differentiate Myotis californicus and Myotis ciliolabrum. Journal of Mammalogy 79(2): 624. Duke, S.D., G.C. Bateman, and M.M. Bateman. 1979. 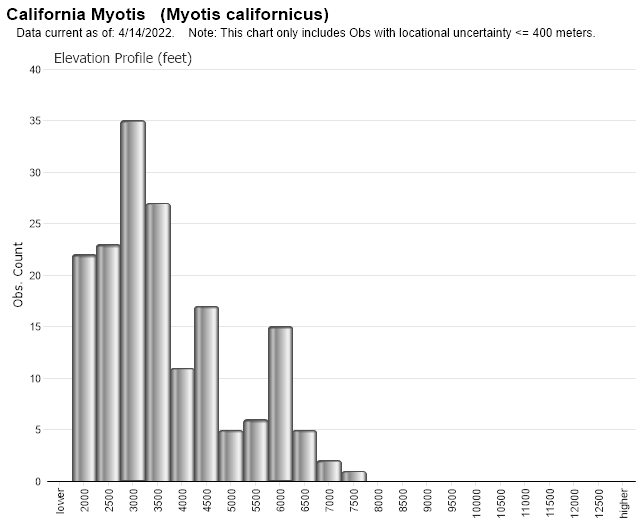 Longevity Record for Myotis californicus. Southwestern Naturalist 24(4): 693-693. Frick, W.F., J.P. Hayes, P.A. Heady III. 2008. Patterns of island occupancy in bats: influences of area and isolation on insular incidence of volant mammals. Global Ecology & Biogeography 17(5): 622-632. Gannon, W.L., R.E. Sherwin, T.N. deCarvalho, M.J. O'Farrell. 2001. Pinnae and echolocation call differences between Myotis californicus and M. ciliolabrum (Chiroptera: Vespertilionidae). Acta Chiropterologica 3(1): 77-91. Geluso, K., and L.N. Mink. 2009. Use of Bridges by Bats (Mammalia: Chiroptera) in the Rio Grande Valley, New Mexico. Southwestern Naturalist, 54(4), 421-429. Krutzsch, Philip H. 1954. "Notes on the habits of the bat, Myotis californicus". Journal of Mammalogy. 35 (4): 539-545. Lacki, M.J., J.S. Johnson, L.E. Dodd, and M.D. Baker. 2007. Prey consumption of insectivorous bats in coniferous forests of north-central Idaho. Northwest Science 81(3): 199-205. Monday, D.C. 1993. California Myotis myotis californicus. Wildlife Views 36(8): 11. O'Farrell, M. J., et al. 1967. Fall and winter bat activity at a desert spring in southern Nevada. The Southwestern Naturalist 12(2):163-171. O'Farrell, M.J. and D.O. Schreiweis. 1978. Annual Brown Fat Dynamcis in (Pipistrellus hesperus) and (Myotis californicus) with Special Reference to Winter Flight Activity. Comparative Biochemistry And Physiology. Part A: Comparative Physiology 61(3): 423-426. Reeder, W.G. 1949. Hibernating Temperature of the Bat, Myotis californicus pallidus. Journal of Mammalogy 30(1): 51-53. Simpson, M.R. 1993. Myotis californicus. American Society of Mammalogists, Mammalian Species No. 428:1-4.
van Zyll de Jong, C.G., M.B. Fenton, and J.G. Woods. 1980. 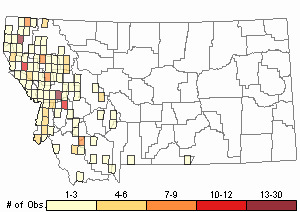 Occurrence of Myotis californicus at Revelstoke and a second record of Myotis septentrionalis for British Columbia. Canadian Field-Naturalist 94(4): 455-456. Vonhof, M.J. and J.C. Gwilliam. 2007. Intra- and interspecific patterns of day roost selection by three species of forest-dwelling bats in Southern British Columbia. Forest Ecology & Management 252(1-3): 165-175. Wunder, L. and A.B. Carey. 1996. Use of the forest canopy by bats. Northwest Science 70:79-85. Young, D.B. and J.F. Scudday. 1975. An incidence of winter activity in Myotis californicus. The Southwestern Naturalist 19(4):452. Web Search Engines for Articles on "California Myotis"